A pretty intense gangster film about a crime boss who finds himself being a target of an unknown enemy. The Long Good Friday is a very cool movie about a gangster who is caught up in the middle of a mystery with no idea why things are suddenly happening to him. Bob Hoskins plays the lead character, Harold, a crime boss who is used to controlling all of underground london. Now there is suddenly one explosion and bomb after another, as well as murder, and Harold needs to find out whose doing it. Aside from that danger storyline, harold is also doing business with the American mafia, trying to close a deal while hiding from them everything that is happening to him and his crew. The movie is great on atmosphere and dynamite on music. The story gets a little slow at times, and the accents are often hard to make out, but it is still a very entertaining film. 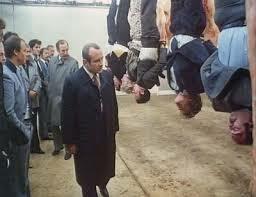 The Long Good Friday is a terrific British gangster movie. Like the films of Guy Ritchie, this movie goes hard at the cockney accents, without any care over whether the audience can understand the dialogue or not. That only means that the more you watch the movie, and the closer attention you pay to what is being said, the more you get the hang of it. Some of the best movies from foreign countries are like that, such as Train spotting. It adds to the authenticity of the movie, as opposed to dumping it down for a mass appeal mainstream audience. The movie is about this crime boss, Harold Shan, (Bob Hoskins), who is on the verge of doing a major deal with the American mafia, based out of New York. These men are flying in to see Harold and talk business with him and with the deal he is about to make, Harold feels like he will be opening up his business to something that is finally legitimate and revolutionary. He’s planning to open up the waterfront property that he owns and makes a toast on a boat in the middle of the Thames River, about what this means for the future. It’s a great scene, with the London bridge right behind Harold as he’s speaking to the crowd on the boat, but not long after he gets back on land, everything starts to fall apart. It begins with the car bombing of Harold’s Rolls Royce. Then one of his top men is killed while in the locker room of a swimming pool. We see each of these scenes even though Harold is not there, and so the movie is not really seen through his eyes. Instead, it’s the story of everything that’s coming down all around him, to his organization. We watch the murder of Harold’s friend in the locker room and then see Harold get the news and realize that someone’s out to get him. This is the worst possible timing, because the Americans have just arrived and are ready to meet Harold and talk business. Only, if they get wind of everything that’s going on, and start to feel like Harold is small time and has enemies that are serious and deadly, then they might get scared and back out of the proposed deal. When another bomb is discovered in the casino that Harold owns, he starts to really get freaked out and think about ways of hiding what is happening from the Americans. there is a dinner meeting, where Harold is supposed to sit down with them, and because of everything that is happening, Harold can’t be there at the meeting. he sends his wife, Victoria (Helen Mirren) instead. the Americans are wise to what’s going on and they call Victoria on it, telling her that she needs to be start being honest with them. that’s when she confesses everything, realizing that being truthful is really the only play that might keep them from walking out on the deal. and then there’s another bomb. this is the third one and the second one that actually went off, and this last one hits the closest to Harold. a movie should build up in intensity with the most exciting parts being saved for later on in the film, and that’s exactly what happens here when a bar that Harold owns explodes just as he is driving up to it. now there’s no more funny business. Harold is done being nice in the way he’s going about it, trying to find out who is behind all this. now it’s time to handle it the old fashioned, no rules, gangster way. that’s what Harold does when he brings in a ton of his old friends and informants and has them all hanging upside down in a meat locker. Harold and his men slide all of these guys around until he has them lined up, all upside down, and starts telling them what’s going to happen if they don’t start talking. this meat locker is where Harold kills people and leaves the bodies to freeze, and all of them know it. now Harold starts to get some answers. the meat locker scene is one of many that show the religious undertones of this movie. hanging upside down is symbolic of Jesus hanging from the cross (although it’s the weakest reference in the movie). a much better reference happens when they find a gangster on the top floor of a parking garage, with nails in his hands, holding him to the floor. and then, of course, there’s the title, the Long Good Friday, and the way the movie is centered on one day one weekend, which just happens to be the weekend of Good Friday. knowing the ending and what happens to Harold also helps with figuring out what the religious ideas of the movie represent. this film is about Harold’s decent into hell. he tried to go legitimate and to be something he wasn’t, but there was no escaping his roots. before he can die, Harold has to go back to what he does best, embrace the old mafia ways of doing things, and only then is free to leave the earth. aside from the violence in this movie, which is handled so well, and in no way gratuitous, the music is also pretty amazing. in fact, it’s probably the number one aspect of the film that helps keep our attention at all times with it’s electrifying energy and hypnotic beats. from the very beginning of this movie, the music kicks in going strong as Harold walks through the airport, being welcomed back to London. 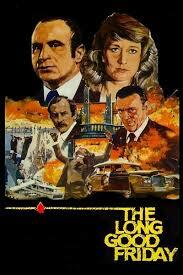 The Long Good Friday is a great movie. it’s not only a gangster movie, but also a mystery with a main character who knows he is the target of something big, but doesn’t who is out to get him or why. The end answers all of the questions, and it all makes a lot of sense, without seeming too convenient or simple. I like the way there is no clear double cross, the way an American movie of today might have done it. instead, there is actually a story to who is after Harold and the reason why, and it’s a lot more complex than just someone who Harold wronged another lifetime ago. Bob Hoskins hits the acting out of the park here, playing the lead of the film, a man who is used to controlling everything, and suddenly finds he really doesn’t have control of anything at all, especially not his own safety. the movie does seem a little slow at times, and it is often a challenge to understand all the dialogue, but it is a fun challenge and a very cool movie.